In cases where the facial and lingual surfaces of an endodontically treated tooth are sound, to conserve the health of the facial and lingual gingival tissues, a partial coverage restoration like an onlay can be designed with adequate resistance form to prevent tooth fracture instead of a full coverage restoration. Ceramic onlays are excellent esthetic restorations that are often a better alternative than a full coverage crown. This case report presents the endodontic treatment of a mandibular molar, followed by postendodontic restoration with ceramic onlay with complete cusp coverage and pulp chamber extension and the case was periodically examined. A 22-year-old male patient presented to the Department of Conservative Dentistry and Endodontics, with a chief complaint of continuous and radiating pain in the left lower back tooth since 2 weeks. The medical history was noncontributory. 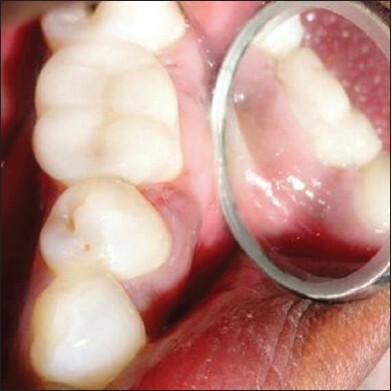 Clinical examination revealed a deep carious lesion in the mandibular left first molar [Figure 1]. 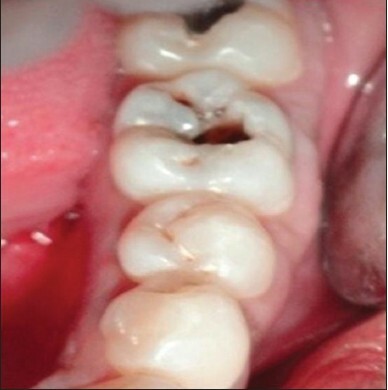 The patient complained of episodes of sensitivity to heat and cold in the involved tooth. After detailed clinical and radiographic examination, a treatment plan was suggested as endodontic therapy followed by ceramic onlay with pulp chamber extension and complete cusp coverage in relation to mandibular left first molar. The patient was informed about the procedure. After administration of local anesthesia, tooth was isolated with a rubber dam and a conservative access opening was prepared. Working length of each canal was confirmed by a radiograph, cleaning and shaping of canals was performed, and the tooth was obturated. Pulp chamber preparation was done by blocking undercuts in the walls and floor of the pulp chamber using hybrid resin composite (Filtek Z250) [Figure 2]. Before preparing the tooth a preliminary impression was made and a B2 shade was selected using the Vita shade guide. Ceramic onlay tooth preparation was done as conservatively as possible using crown and bridge preparation kit (Shofu, Crown and Bridge Preparation Kit). Cuspal reduction was done in the form of capping rather than shoeing. Internal angles were made rounded to enhance adaptation of restorative material. Depth orientation grooves are placed on the cusps. 1.5-2.0 mm of occlusal clearance was done to prevent fracture in all excursions. 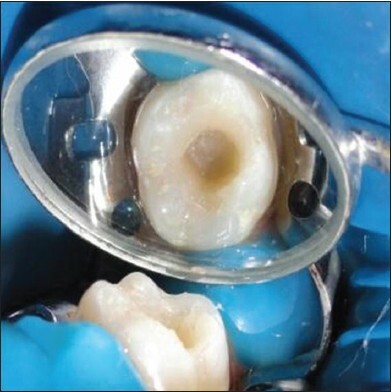 Hollow ground chamfer with no conventional bevel confined to the marginal enamel was placed which aided in developing an effective seal. A distinct heavy chamfer was placed on the facial and lingual surfaces with supragingival margins. Smooth, distinct margins are essential for an accurately fitting ceramic onlay restoration [Figure 3]. Preparation details were recorded with a low viscosity material (Aquasil, Dentsply). 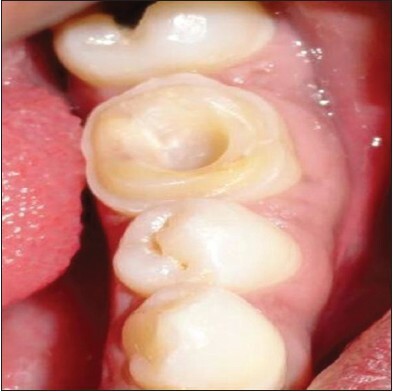 Temporary restoration was cemented with a eugenol-free temporary cement. As esthetics is one of the prime concern for the patient, IPS Empress II was selected for the fabrication of the ceramic restoration. The restoration was carefully positioned to check the marginal adaptation, shape, and shade with complete satisfactory results. The operating field was isolated with a rubber dam. Following etching, a dentin bonding system was used. Self-adhesive universal resin cement is applied to the restoration and inserted with slight pressure. Excess of cement from the margins was removed with a microbrush. Residual excess cement was removed using explorer and dental floss. Final polishing was achieved using diamond impregnated finishing points and polishing gels [Figure 4]. The patient was periodically reviewed after 6 months, 1 year, and 2 years. As the onlay preparations are more conservative, most of the tooth structure is preserved during preparation and the time needed for preparation is more less than that needed for a full coverage restorations and placing the supragingival margins causes less damage to the periodontal tissues. But further long-term data are necessary before this treatment to be considered for general dental practice. Ceramic onlays are partial coverage restorations which are alternative for restoring endodontically treated posterior teeth in certain clinical situations without interfering with the adjacent periodontal tissues, and not compromising much tooth structure, ceramic onlays satisfy both functional and esthetic demands of patient. 1. Wagnild GW, Mueller KI. Restoration of the endodontically -treated tooth. In: Cohen S, Burns RC, editors. Pathways of the Pulp. 8 th ed. St Louis, MO, USA: Mosby Inc; 2002. p. 765-95. 2. Goerig AC, Mueninghoff LA. Management of the endodontically treated tooth. Part II: Technique. J Prosthet Dent 1983;49:491-7. 3. Reeh ES, Douglas WH, Messer HH. Stiffness of endodontically-treated teeth related to restoration technique. J Dent Res 1989;68:1540-4. 4. Griggs JA. Recent advances in materials for all-ceramic restorations. Dent Clin North Am 2007;51:713-27, viii. 5. Roberson TM, Heymann HO, Swift EJ. Sturdevant's Art and Science of Operative Dentistry. 5 th ed. St Louis: Mosby; 2006. p. 883. 6. Reeh ES, Messer HH, Douglas WH. Reduction in tooth stiffness as a result of endodontic and restorative procedures. J Endod 1989;15:512-6. 7. Sorensen JA, Martinoff JT. Intracoronal reinforcement and coronal coverage: A study of endodontically treated teeth. J Prosthet Dent 1984;51:780-4. 8. Smales RJ, Hawthorne WS. Long-term survival of extensive amalgams and posterior crowns. J Dent 1997;25:225-7. 9. Holand W, Schweiger M, Frank M, Rheinberger V. A comparison of the microstructure and properties of the IPS Empress 2 and the IPS Empress glass-ceramics. J Biomed Mater Res 2000;53:297-303. 10. Valenti M, Valenti A. Retrospective survival analysis of 261 lithium disilicate crowns in a private general practice. Quintessence Int 2009;40:573-9. 11. Tagtekin DA, Ozyöney G, Yanikoglu F. Two-year clinical evaluation of IPS Empress II ceramic onlays/inlays. Oper Dent 2009;34;369-78. 12. Naeselius K, Arnelund CF, Molin MK. Clinical evaluation of all-ceramic onlays: A 4-year retrospective study. Int J Prosthodont 2008;21:40-4. 13. Sharma A, Rahul GR, Gupta B, Hafeez M. Biological width: No violation zone. Eur J Gen Dent 2012;1:137-41.